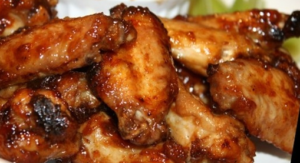 We just love this recipe for wings. They are definitely hard to describe: sweet, crispy, a little sticky. They are our favorite way to prepare wings now, and it’s a super simple recipe! Let’s know how to make it. The direction is given below. At first place chicken into a large bowl. In a small jug combine soy, garlic, ginger, lemon and honey. Stir well then pour half over the chicken leaving to marinate for at least 1 hour or even overnight. Stir a couple of times. Now preheat a BBQ or oven to 180°C. Do drain most of the marinade from the chicken. Place chicken on the BBQ and cook for 20 minutes each side or until cooked through and juices run clear. Keep an eye on them not to burn. Alternatively bake in the oven for 40 minutes. To make the coleslaw – Toss the cabbage, carrot and mayonnaise in a bowl. Now heat the remainder of the marinade and simmer for a few minutes to thicken slightly. After that to serve pour the heated sauce over the chicken wings. Garnish with parsley and serve with coleslaw and bread rolls. TIP: Line your BBQ with tinfoil before cooking the chicken. It will prevent burning and sticking. Thank you !